Hey there! I AM BACK!! This has been such a long time. I come back bearing apologies and explanations. While I am terribly sorry for not posting anything this past month I was REALLY busy with my Masters workload and deadlines. Of course priorities had to be set but with that out of the way now I get back to this. 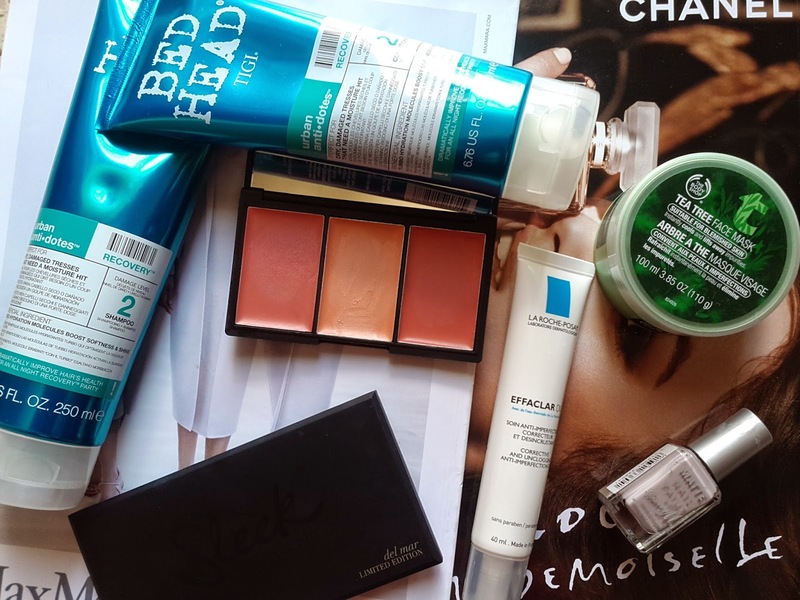 I'm quite sure I have skipped on both my March and April favourites, which can only mean that now I have a lot of favourites to share with you guys. P.S. It is important to keep reading...something special awaits further down. La Roche-Posay Effoclar Duo - This has literally been my miracle in a tube these last two months. My skin was very irritated and was breaking out so much. I had been hearing a lot about this product so I went for it after trying absolutely everything. Applying just after cleansing, before moisturising, twice a day and bam...magic. I do not suggest using the product if you don't have anything to work on because you don't want your skin to get used to it. But, if you're like me, and your skin is easily irritated well then this should be your next investment because it is a good product to have at grabs reach. Given my skin irritation issues lately I have also tried to find a more specific face mask to deal with this. I gave the Body Shop Tea Tree Face Mask a go and I have been liking it a lot. First of all it leaves a very fresh, cool feeling on your face, this will be great when the weather is a lot hotter and a face mask is the last thing you feel like. Secondly, it did help calm down the blemishing quite a lot. I don't recall ever sharing any hair favourites but there's a first time for everything of course. This entry is thanks to TIGI Bed Head Urban Antidotes Recovery Shampoo and Conditioner. I got these from feelunique.com, they were on offer together for £5....I mean at that price you can't go wrong. My hair really needed a revamp because of all the heat that I had been using on it and when I saw these at that price I thought I'd give them a go. I've only used them twice really but the effects are immediate and visible. My hair dried into a soft, shiny texture and, even though my hair is not dyed, my natural colour was so enhanced. I'm not even joking, but I got so many comments on how my hair looked after using this. Sleek Blush By 3 Californ.I.A. - First of all this is an absolute bargain, €12.99 for 3 blushes is a really good price. Secondly, this palette is a set of 3 CREAM blushes. Now, I was always a bit scared of cream blushes, I don't know why! I gave in...I wanted to try them. They happen to be AMAZING. If you're after a good long lasting blush, one of these is perfect. Also the three colours have different undertones, one is a bit more browny, one is peachy and one is quite pinky. Plus the compact comes with a mirror so pretty handy for travelling. Barry M Matte Nail Paint Vanilla - You know I love my Barry M nailpolishes, so I had to put one in this month as well. I've probably talked about this shade before, but these months, with the transition in seasons, I've be using it non-stop. Even though 'vanilla' might suggest that it is a white colour, well it is not. It is a lilacy grey which is dull because of it's matte finish (this makes it A/W) but light in colour (this makes it great for S/S). I also like this shade because it is nice for all events and is very natural. Basically, an all-round win product. Tanya Burr Lipgloss; Picnic in the Park - Since I got this in April I have never put on any different lip product. I don't know if it's the fact that it's Tanya Burr's and she is my favourite person in the world, but I have used it quite a bit. All bias apart, it is very good texture and quite lasting but you might need to reapply from time to time. Amazing shade choice, Picnic in the park is a cute girly pink so I felt like this is the time to wear it. Lovely line Tanya..love them. My grand finale favourite is the Sleek i Divine in DEL MAR. This is a limited edition palette with all the shades you need to complete the S/S 14 eyeshadow trends. I love sleek eyeshadows, the first palette I owned was theirs and I can't get enough. Which is also why as time goes by my collection of their palettes is increasing. Being completely honest, I'm not the kind of girl to go for the coloured eyeshadows and this purchase was made impulsively...I guess...but I don't regret it. I use this palette all the for day looks by simply choosing a colour and apply it with a fluffy shadow brush. This way of applying it does not leave a bright, bold coloured lid but a wash of colour as the trends call for. Over the time I was away I reached 500 followers which to me was AMAZING and I can't thank you enough for your support. 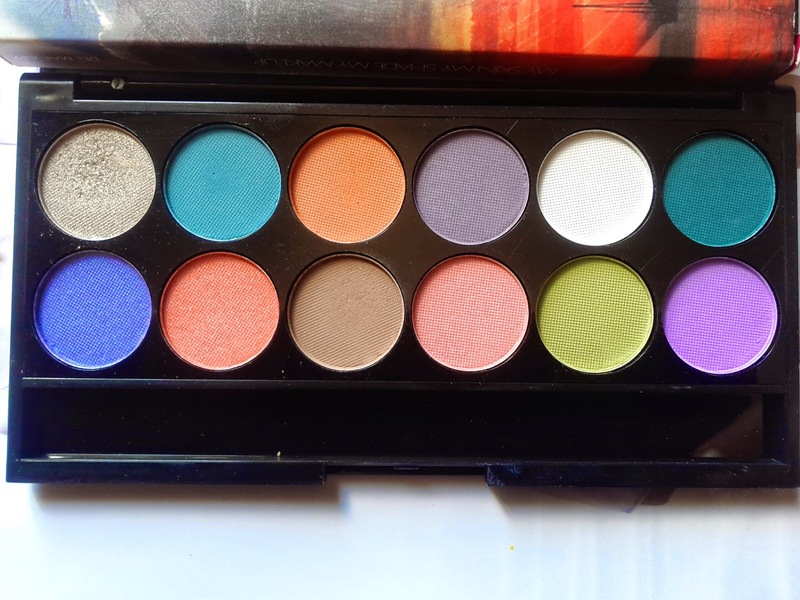 As a little treat I am giving away a DEL MAR (new of course) palette which I love SOOO much. Being a perfect compilation of the S/S 14 trends, I'm sure you'll appreciate it. These are the rules and ways you can enter the competition. 2. Leave a comment on this post and tell me why you want this palette or any favourites that you've had this month. 29 comments on "The May Favourites & GIVEAWAY"
Hi Rebecca,I loved the info about your skin care favs. I almost forgot I had the Body shop tea tree face mask, I remember it was great! Atm I am using Dermalogica Clear Start Breakout Clearing Kit, it rly limits breakages and leaves the skin soft without any traces of oil. Ps. I love the colours of your giveaway and I would love to start experimeting with my eyes a bit more! I’d like to win because it’d be a good addition to my collection and I can mix and match with the different colours :) Also, Sleek isn’t available here and I really want to try it. awesome! great colors.. i want to win those to try out those colors! love it! I want to win sleek makeup palette as can't get sleek makeup at where i live as well as i am not really a fan of online shopping so i dont dare order online . I want this Sleek i-Divine Del mar Palette as I have heard so much review about it and never get the chance to try! the palette is so beautiful, I love the shades! I’d like to get my hands on the Sleek i-Divine Del Mar Palette! Eyeshadow is an essential part of my everyday make-up routine. I love to experiment with natural and more dramatic looks depending on the occasion. Its look very interesting and and i really like to have one.